Meantime in Louisiana nary is heard a discouraging word…….. But in the denial of one application, court records show the Gaming Board took issue with the criminal record of one of (Nicky) Nichols’ Illinois partners and Nichols’ association with his father-in-law, Robert Guidry, who once testified to paying bribes to land a Louisiana casino license. The Gaming Board also said Nichols “engaged in questionable business practices related to business transactions” with Tim Whitmer, once a Louisiana parish official. At the last council meeting, Councilwoman Cynthia Lee-Sheng was criticized for receiving tens of thousands of dollars in campaign contributions in a single day from a group of businesses owned by the same individuals. “I’m not going to apologize for receiving campaign contributions,” Lee-Sheng said. “I’m happy to help my contributors. Author Douglas HandshoePosted on October 8, 2013 March 13, 2014 Categories SopTags Jefferson Parish Councilperson Cynthia Lee-Sheng, Nicky Nichols, Redman Gaming, Robert Guidry, USA v Edwards, USA v Guidry, USA v Perdigao, Video PokerLeave a comment on Meantime in Louisiana nary is heard a discouraging word…….. Author Douglas HandshoePosted on January 29, 2013 March 14, 2014 Categories SopTags Cary Goss, Trout Point Development, USA v Broussard, USA v Edwards3 Comments on Who dat? Lets disclose another branch of the Louisiana to Nova Scotia political family as Slabbed welcomes Edwin Edwards crony Carey S Goss to the Trout Point Lodge Party. Several days ago it came to my attention that a gentleman named “Carey” S Goss was one of the land owners at the Trout Point Development. History remembers Goss as an EWE unindicted co-conspirator that is also well-remembered as one of the guys that tried wiretapping FBI agents investigating Edwin Edwards back in the late 1990’s. So along those lines it did not surprise me to see his name listed on the map of the Trout Point Development done by the good people at the SouthCoast Today that is color coded to its ownership. The map is a must see graphic as a picture is indeed worth 1,000 words. Author Douglas HandshoePosted on January 29, 2012 March 14, 2014 Categories SopTags Aaron Broussard, Charles Leary, Danny Abel, David Loeb, Jefferson Parish Political Corruption Scandal, Roy D'Aquilla, Trout Point Lodge, USA v Edwards, Vaughn Perret7 Comments on Lets disclose another branch of the Louisiana to Nova Scotia political family as Slabbed welcomes Edwin Edwards crony Carey S Goss to the Trout Point Lodge Party. Illinois embraces video poker Louisiana style: Self serving politicians, crooks and organized crime is a match made in heaven…. Nicky Nichols became a major player in the Louisiana world of video gambling while cutting key politicians in on the game. Now he has brought some notable business partners to his Illinois ventures: Louisiana legislators. Folks it appears Robert Guidry is still a very busy man these days as the Guidry family’s move into emerging gaming markets in places like Pennsylvania and Illinois is well chronicled in the Joseph Ryan story linked above. This is also a classic case study in self-serving double-dealing politicians rationalizing their greed. 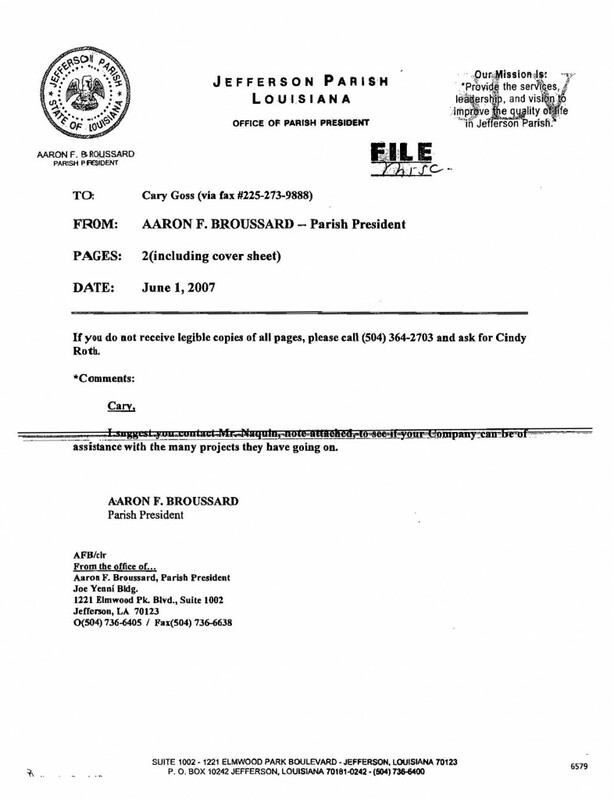 You good folks up in Illinois that regularly read us (you know who you are) please visit our prior coverage of the Perdigao saga for a possible explanation why Guidry was allowed to keep his gaming license by former US Attorney Eddie Jordan in Louisiana despite the fact he testified to bribing Gov Edwin Edwards to get it. Video Poker in Louisiana is rotten to the core IMHO, a stench filled world where a corrupt and broke local sheriff can become a video poker magnet in his own right leaving the local taxpayers the legacy of his corrupt political hack daughter who is very ably filling daddy’s shoes in the criminal enterprise that is Jefferson Parish Louisiana. I’ll add that Illinois Legislator Lou Lang from Skokie (aka Hoboken Midwest) appears to be as crooked as they come. In so many ways the marriage of crooked Louisiana and Illinois legislators is a match made in pay to play heaven. Author Douglas HandshoePosted on July 12, 2011 March 14, 2014 Categories SopTags Alton Ashy, Corrupt Politicians, Eddie Jordan, Jefferson Parish Councilperson Cynthia Lee-Sheng, Louisiana Representative Damon Baldone, Louisiana Representative Ernest Wooton, Nicky Nichols, Organized Crime, Redman Gaming, Robert Guidry, State Representative Lou Lang, USA v Edwards, USA v Guidry, Video Poker7 Comments on Illinois embraces video poker Louisiana style: Self serving politicians, crooks and organized crime is a match made in heaven….